As reported by Motorcycle.com two year ago, Vectrix had teamed with Daimler to produce a smart e-scooter for 2014. Today Vectrix has announced that scooter’s arrival. 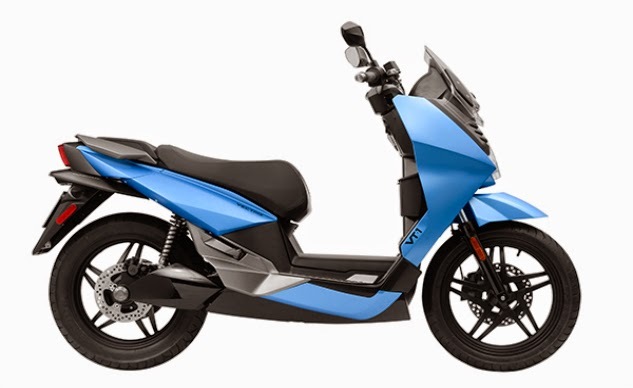 The new electric scooter boasts interchangeable (no tool required) and scaleable lithium batteries, a patented Planetary Gear Drive system, regenerative braking/throttle technology, a 62-mph top speed and a range of up to 55 miles. The VT-1 plugs into standard 220V/110V outlets via a 10-foot braided cord residing under the seat. Charging times are three hours from zero to 80% while zero-to-full charging times range from four to six hours depending on batter configuration. Instead of a belt or chain the VT-1 is propelled by its Planetary Gear Drive system which is a 3-to-1 reduction gear drive. Vectrix says the gear drive system needs no maintenance until a recommended re-lubrication at 200,000 miles.